The total number of confirmed mumps cases in Hawai‘i as of Thursday, Jan. 4, 2018, stands at 770, with 108 on Hawai‘i Island, 610 on O‘ahu, 49 on Kaua‘i and three on Maui. 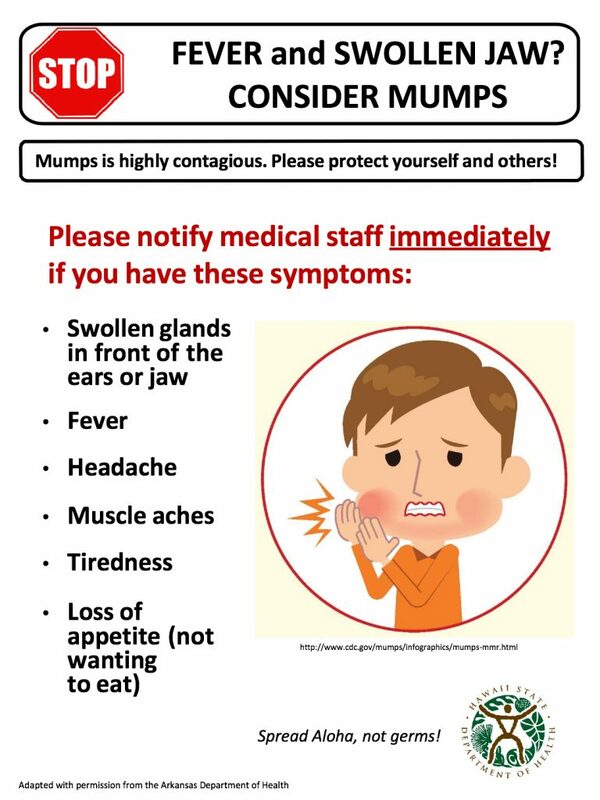 The ongoing mumps outbreak is by far the worst in several decades for Hawai‘i, which typically has fewer than 10 cases a year. State Epidemiologist and Chief of the Disease Outbreak Control Division Dr. Sarah Park noted that in previous years, mumps cases were imported, but recently outbreak cases have been acquired locally. What began in March 2017 as two clusters of cases involving nine individuals on O‘ahu, increased to 500, with confirmed cases in all counties by late October 2017. Commonly considered a disease that affects only young children, mumps, is affecting primarily adults and adolescents in Hawai‘i. Adults between the ages of 20 and early 40s, and adolescents 10 years old and above make up the majority of Hawai‘i’s recent mumps cases, according to the Hawai‘i Department of Health (DOH). However, the DOH offers practical ways to avoid getting the disease. Hawai‘i is not the only state that has experienced a mumps epidemic. According to the Centers for Disease Control and Prevention (CDC), from Sunday, Jan. 1, through Saturday, Dec. 2, 2017, 48 states and the District of Columbia, reported mumps infections. In addition to Hawai‘i, Washington, Texas, Arkansas, Missouri and New York each reported more than 300 cases in 2017. The MMR vaccine is available at local pharmacies. To locate a vaccinating pharmacy nearest you, go online or call the Aloha United Way information and referral line at 2-1-1. Additional information about mumps can be found on the DOH website. Michael Brigoli has followed a career path from Army medic to Hawaiʻi County firefighter paramedic to medical student. His next step is to become a doctor at the John A. Burns School of Medicine (JABSOM) at the University of Hawaiʻi at Mānoa. Brigoli is earning national accolades on the way. 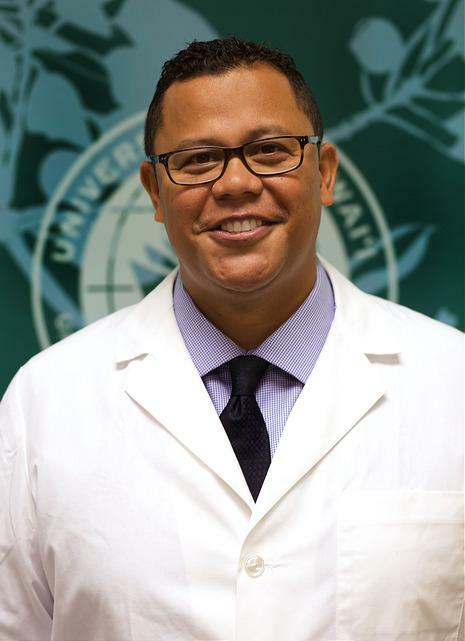 The 43-year-old, non-traditional student is one of only seven future physicians selected by the American Association of Medical Colleges to appear on its Anatomy of an Applicant: Demonstrating Core Competencies website. He was nominated by JABSOM Admissions Director Ivy Nip-Asano. Brogoli enlisted in the U.S. Army after leaving college without a degree. He was trained as a medic and after his military commitment, he became a Hawaiʻi County firefighter. As a paramedic in the rural community where he grew up, he resolved to become a doctor. Brigoli was impressed by JABSOM’s strong commitment to Native Hawaiian health and to training and graduating Native Hawaiian physicians. Michael Brigoli is congratulated at JABSOM for being named a Kahanamoku Scholar, 2017. Courtesy photo. See Brogoli’s complete profile here. 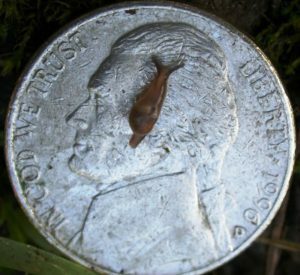 See the full story, which includes a video, on the JABSOM website. The Hawaii Department of Health has added Amyotrophic Lateral Sclerosis (ALS) to the list of qualifying conditions for medical cannabis use. The decision was based on a rigorous review and analysis of written and oral testimony, a public hearing, and peer-reviewed scientific evidence. Of the 29 states and U.S. jurisdictions that permit medical cannabis, 19 include ALS as a qualifying health condition. Although the Hawaii Department of Health found little evidence to support the value of medical cannabis for ALS; DOH determined medical cannabis may be appropriate for patients diagnosed with ALS after receiving a comprehensive assessment by a patient’s physician or APRN and a risk-benefit discussion. In April 2017, the Department of Health opened the petition process to allow patients, physicians, and advance practice registered nurses (APRNs) to petition the department to add new debilitating medical conditions to the existing list of conditions that could benefit from the use medical cannabis. Unlike prescription medications that undergo rigorous clinical trials for the treatment of certain health conditions before being released to consumers, medical cannabis does not have that same level of evaluation by the U.S. Food and Drug Administration. Under Hawaii Revised Statutes, all new conditions must be thoroughly reviewed from an evidence-based perspective and be subject to a public hearing. This year, the Department of Health received two such requests and began the review process. The other condition submitted for consideration was general anxiety disorder (GAD). The Department of Health declined this request because at this time there is inconclusive medical evidence that cannabis has beneficial use in the treatment or alleviation of symptoms of anxiety, social phobia, and social anxiety disorder (SAD), and no evidence specific to GAD. In addition, because the prevalence of GAD, high rate of comorbidities, and dearth of scientific evidence to support the use of cannabis in the treatment of GAD, the potential for adverse outcomes is a public health concern. Next year’s deadline to request the addition of new health conditions is Feb. 19, 2018. The petition form is available online for patients, physicians, and APRNs and must be submitted by the deadline to be included in the public hearings tentatively scheduled for May 2018. Any petitions received after Feb. 19 may be considered the following year. Women who became first-time mothers as teens were significantly more likely than older mothers to have greater risks for heart and blood vessel disease later in life, according to a new study in the Journal of the American Heart Association. Catherine Pirkle, an assistant professor in the Office of Public Health Studies at the University of Hawaiʻi at Mānoa, served as lead author. Researchers found that women reporting a first birth before the age of 20 scored significantly higher on the Framingham Risk Score, a measure commonly used to estimate the 10-year cardiovascular risk. In comparison, women whose first births occurred at older ages had lower average risk scores. The lowest cardiovascular risk, however, was among women who had never given birth. While previous studies found that women who had several pregnancies had higher cardiovascular risks, in the most recent study, the number of lifetimes births did not affect cardiovascular risk. Pirkle notes that women who had never given birth may have miscarried or terminated pregnancies, but would have experienced dramatically lower average levels of pregnancy-related complications. Therefore, they would have no, or much shorter durations, of pregnancy-related stress on the body, which may explain the lower average risk scores in that group. Investigators obtained information about age at first birth for 1,047 women participating in the International Mobility in Aging Study in 2012. Study participants were between the ages of 65 and 74 and were from Canada, Albania, Colombia and Brazil. Read more at the American Heart Association story. Hawaii ranks 5th nationwide in funding programs that prevent kids from smoking and help smokers quit, according to a report released today by leading public health organizations. Hawaii is spending $6.6 million this year on tobacco prevention and cessation programs, which is 48.1 percent of the $13.7 million recommended by the Centers for Disease Control and Prevention (CDC). The report challenges states to do more to fight tobacco use – the nation’s leading cause of preventable death – and make the next generation tobacco-free. In Hawaii, 9.7 percent of high school students smoke, and 500 kids become regular smokers each year. Tobacco use claims 1,400 Hawaii lives and costs the state $526 million in health care bills annually. Hawaii will collect $163.9 million in revenue this year from the 1998 tobacco settlement and tobacco taxes, but will spend only 4 percent of the money on tobacco prevention programs. Tobacco companies spend $25.5 million each year to market their deadly and addictive products in Hawaii – almost 4 times what the state spends on tobacco prevention. Nationwide, tobacco companies spend $8.9 billion a year on marketing – that’s $1 million every hour. The report – “Broken Promises to Our Children: A State-by-State Look at the 1998 Tobacco Settlement 19 Years Later” – was released by the Campaign for Tobacco-Free Kids, American Cancer Society Cancer Action Network, American Heart Association, American Lung Association, the Robert Wood Johnson Foundation, Americans for Nonsmokers’ Rights and Truth Initiative. Hawaii has been a leader in the fight against tobacco. It has a high cigarette tax ($3.20 per pack, 5th among the states), a comprehensive smoke-free law, and in 2015 became the first state to raise the tobacco age to 21. This year Hawaii increased tobacco prevention funding by 25 percent (to $6.6 million), the first increase since 2012. However, total funding is still less than half what the CDC recommends. Today’s report also highlights large disparities in who smokes and who suffers from tobacco-related diseases in the United States. Smoking rates are especially high in a swath of 12 states in the Midwest and South, an area called “Tobacco Nation” in a recent Truth Initiative report. Nationwide, smoking rates are highest among people who live below the poverty level and have less education, American Indians/Alaska Natives, LGBT Americans, those who are uninsured or on Medicaid, and those with mental illness. These differences are in large part due to the tobacco industry’s targeting of vulnerable populations through advertising, price discounting and other marketing strategies. America’s health is challenged by an increase in premature death and uneven concentration of health care providers, according to key findings in United Health Foundation’s America’s Health Rankings Annual Report. America’s Health Rankings Annual Report, now in its 28th year, provides a holistic view of the health of the nation and of each state by analyzing 35 measures of behaviors, community and environment, policy, clinical care and outcomes data. The report finds increases in the rates for three key mortality indicators. The premature death rate increased for the third year in a row. The rate increased by 3 percent from 2015. Premature death is defined as the years of potential life lost before age 75. In the past year, the rate of drug deaths continued an upward trend, increasing by 7 percent to its highest level ever as measured by the America’s Health Rankings Annual Report. Cardiovascular deaths increased for the second consecutive year, with the rate among African Americans significantly higher than the rate among whites, Hispanic- and Asian-Americans, and Native Americans. Increases in key mortality indicators are being felt even in the nation’s healthiest states. In the past five years, some of the healthiest states by overall rank have experienced large increases in drug death rates, including New Hampshire (a 118 percent increase, with an additional 13-plus deaths per 100,000 people), Rhode Island (a 56 percent increase, with an additional 8-plus deaths per 100,000 people) and Massachusetts (a 69 percent increase, with an additional 8-plus deaths per 100,000 people). In the past five years, Utah (ranked as the fourth healthiest state) experienced one of the largest increases in the rate of cardiovascular deaths (10 percent, with additional 21-plus deaths per 100,000 people). The wide variation in health care providers across the country may contribute to differences in overall health. The state with the highest concentration of mental health care providers, Massachusetts, has six times the number of mental health care providers than the state with the least amount, Alabama, Massachusetts has 547 care providers per 100,000 people vs. Alabama, which has 85 care providers per 100,000 people. There is also a significant variation in primary care physicians, with a nearly two-to-one ratio between the states with the highest and lowest concentrations. Rhode Island, Massachusetts, New York and Connecticut have more than 200 primary care physicians per 100,000 people, compared to fewer than 100 physicians per 100,000 people in Utah and Idaho. Similarly, the concentration of dentists varies by almost two to one across states. Massachusetts and New Jersey have more than 80 dentists per 100,000 people. Arkansas, Mississippi, Alabama and Delaware have fewer than 45 dentists per 100,000 people. Massachusetts ranks as the healthiest state in 2017 for the first time, followed by Hawaii (2), Vermont (3), Utah (4) and Connecticut (5). Mississippi is ranked 50th for the second year in a row with Louisiana (49), Arkansas (48), Alabama (47) and West Virginia (46) rounding out the states with greatest opportunities for improvement. The Hawai‘i Dental Association (HDA) and the Hawai‘i State Department of Education (HIDOE) are renewing their commitment to educating kids about the importance of dental hygiene. The agencies have continued their Memorandum of Agreement (MOA) to promote oral health by teaching students proper dental hygiene techniques and providing information about access to free dental health services. HDA will conduct informational presentations in HIDOE first and second grade classes on O‘ahu, Maui, Kaua‘i and Hawai‘i Island through December 2017 and again from January through February 2018, which is National Children’s Dental Health Month. These efforts are also part of a national initiative from the American Dental Association to bring preventative education and dental services to underserved children, which includes 92,000 economically disadvantaged public school students in Hawai‘i. This partnership highlights the work that has been done by the department to ensure that all students come to school healthy and ready to learn. 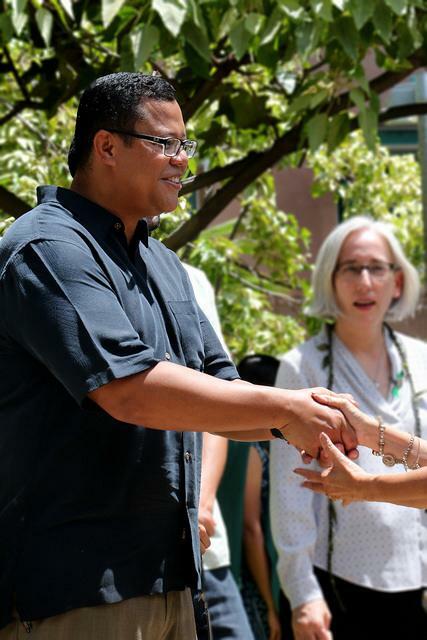 Other healthcare partners include the University of Hawai‘i at Mānoa, which launched the “Hawai‘i Keiki” program with the department in 2014 and has increased school-based health services. The Hawaii Rotary Club is sponsoring statewide bike rides that will be happening from Saturday, Nov. 11 through Saturday, Nov. 18. The purpose of these rides is to help to put an end to polio. During this week, there will be Rotarians, individual community members, biking groups and clubs riding bikes and those on stationary bikes in health clubs and gyms all riding in the support of eradicating polio. This ride is different in that no roads need be closed as everyone will ride on their own schedule and desired distance. Each rider will pay a $20.00 registration fee and will also have friends and family sponsor their ride with all those donations going to Rotary’s Polio Plus program. When Rotary started the campaign to eradicate polio in 1988 there were 350,000 cases a year in the world. As of the date of this writing there are 10 cases worldwide – 6 in Afghanistan and 4 in Pakistan. This isn’t good enough – Zero is the magic number. Each rider will receive a commemorative towel with the specially designed logo once they complete their ride and bring in a minimum of $100.00 in sponsor donations. Do even more by challenging another rider to see how many sponsor dollars you can bring in. Join in the fun by becoming a rider and/or sponsoring a rider to help Rotary End Polio Now. The Hawaii Department of Health (DOH), in collaboration with the Hawaii Children’s Action Network, Head Start Collaboration Office, and Hawaii Head Start and Early Head Start programs, is conducting a statewide oral health screening project, beginning this fall. The project, which focuses on Hawaii keiki who are most at risk for cavities, builds upon the foundation set by the DOH’s Hawaii Smiles statewide third-grade screening project two years ago. The current project will look at younger children and include an oral health screening for every child enrolled in the Head Start and Early Head Start programs. The first screening is scheduled at the Parents and Children Together (PACT) headquarters at The Towers at Kuhio Park on Tuesday, Oct. 17, beginning at 10 am. Altogether, more than 2,970 children at more than 100 Head Start and Early Head Start sites statewide will have a dental screening in this school year. The health department will use this data on the oral health of these young children to inform the U.S. Centers for Disease Control and Prevention (CDC) and develop policies and programs to improve the oral health of children across Hawaii. 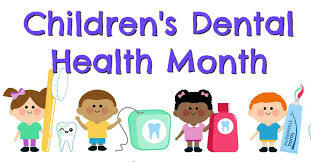 The Hawaii Smiles report recommended community-based prevention programs that focus on oral health promotion and prevention services in early childhood programs to reach children at a younger age. The Early Head Start and Head Start programs were identified because of their extensive reach to children from birth to five years old. The HDS Foundation gave a $45,000 grant to the Hawaii Children’s Action Network, which is helping to coordinate the logistics of this project, to expand the outreach efforts to an additional 59 sites and to conduct dental screenings for an additional 1,520 infants, toddlers and preschoolers for a total of more than 2,970 children.